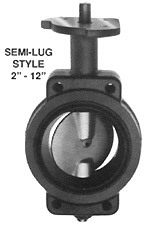 Semi-Lug Style Butterfly Valves available from Robert-James Sales, Inc.
Superior design and construction of a 200 PSI-WOG (2" - 12") or 150 PSI-WOG (14" - 24") rated butterfly valve will assure years of dependable performance. The advanced design of the dual-durometer phenolic reinforced resilient seat provides a low torque, bubble-tight shutoff. Designed for ANSI 125/150 lb. class flanges, these valves comply with MSS-SP-25, MSS-SP-67 and API-609 specifications. Also meets requirements of MIL-V-22133C (SHIPS), Type 1. Classes A-D. Cast in-place mounting flange accommodates all types of operators: manual handles and gear operators; pneumatic, hydraulic, diaphragm and electric actuators. Bronze stem bushings are oil impregnated to provide minimum torque and maximum stem support. Heavy duty upper bushing absorbs side loading for maximum operator performance. Each valve hydrostatically tested on both sides to 225 PSI for 2" - 12", 165 PSI for 14" - 24". 10" and 12" wafer types have drilled guide lugs. All full lug bodies are threaded. Drilled holes optional at no extra cost. Long neck design allows ample clearance for insulation. Dual stem seal is between disc and seat spherical hubs (Patent 3565394), additional seal from seat O-ring. Streamlined disc design reduces pressure drop and minimizes turbulence. Resilient seat design eliminates the need for flange gaskets. Phenolic reinforced resilient seat in sizes 2' - 12" is blowout-proof, stretch resistant and non-collapsible, making it ideal for high velocity or vacuum service (up to 28" Hg). Two-piece blowout proof stem design allows field replacement of seats. Pressure/temperature rating of ANSI 150, at CWP of 285 PSI at 100 degrees F. Available upon application. Halar and Kynar coated discs available.